The management of a Christian congregation requires faith, integrity, and resourcefulness. From member and guest registers to pew cards to flower charts and calendars, we offer a full range of resources to help congregations meet their administrative and record-keeping needs. A helpful guide for pastors and altar guild members. Dates are printed in the appropriate liturgical colors according to the three-year lectionary. Communication Card with verse from Psalm 48:1. Communication Card with verse from John 3:16. These welcome folders feature a verse of Scripture from Psalm 48:1 are wonderful resources to give to visitors or new church members. These welcome folders feature a verse of Scripture from John 3:16 are wonderful resources to give to visitors or new church members. Prayer request card with verse from Colossians 1:3. Welcome to Our Church card with verse from 2 Peter 3:18. These welcome folders featuring beautiful stained-glass art and a verse of Scripture from 2 Peter 3 are wonderful resources to give to visitors or new church members. These welcome folders featuring bright, friendly colors and a verse of Scripture from Psalm 117 are wonderful resources to give to visitors or new church members. Place these welcoming cross visitor cards in pew racks so that guests can record their church visit and communicate how the church might serve their needs. Designed for use with a church seal desk press, these easy-to-use labels are made of gold foil with an adhesive gum backing. Each package contains 40 labels. Keep your church history in a single binder! 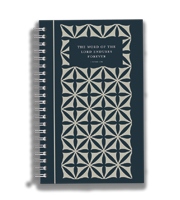 Use this stately register book to record church membership, baptisms, confirmations, marriages, funerals, and other events. This desk press creates a beautiful embossed seal in one of three designs, customized to your church. Seal measures approximately 2 inches in diameter. This colorful chart with a contemporary design twist is a helpful resource for those wishing to provide altar flowers, listing service dates and donor names by month. These envelopes with transparent windows are designed and sized especially for church offering records. Each package contains 500 7 3/4" x 3 5/8" envelopes. This colorful chart includes space to record service dates and flower donor names by calendar month. It is a great help to those wishing to donate altar flowers. These guess book replacement sheets fit 22-ring guest books. Individual sheets measure 8 ½" x 11", and each package of 25 sheets will hold 500 entries. These custom imprint calendars pair splendid nature images with inspirational Scripture verses and mark both church and national holidays. Minimum 50. Make sure your church members and visitors can communicate using your pew cards with these miniature yellow pew pencils which are designed to fit pew racks. Record your church's fellowship on a weekly basis with this red vinyl book. Each record book has the LCMS logo cross imprinted on the cover and includes a pencil slot. This keepsake new member booklet includes the Rite of Receiving New Members, What Lutherans Believe, and a brief history of the Lutheran ChurchMissouri Synod.